Did you know there are stages of sleep? Although most of us know about the importance of getting a good night’s sleep, comprehending our sleep cycles will help us understand our bodies and the rest we need. Every night when we drift off to sleep our bodies begin a sleep cycle. Each stage and cycle causes a particular reaction in our bodies that help us repair our muscles and boosts our immune system. Additionally, reaching a deep sleep helps us refresh our brain and process memories. A sleep cycle refers to the stages of sleep we go through every night when sleeping. In fact, these stages chronicle the time it takes for us to go through each stage. Unbeknownst to many, we go through various cycles with each stage lasting approximately 5 to 15 minutes and a complete cycle averaging at 90 minutes. Every individual, on average, goes through four to five cycles every night with the time it takes to complete a cycle increasing from 90 minutes to 100 and 120 minutes. So what are the stages of sleep and what do they consist of? There are five stages made up of stage 1, stage 2, stage 3, stage 4, and REM (rapid eye movement) sleep. These stages each play an important role in your nightly sleep patterns and can determine the quality of sleep you get. Stage 1: This early stage is experienced in the first seconds or minutes after drifting off to sleep which is also known as light sleeping. It’s during this stage when you are most sensitive to noises or movement, meaning you can be awoken easily. You may also experience muscle contractions, a sensation of falling, and twitching. Lastly, it’s also at this stage that the muscle activity in your body slows down significantly as well as your eye movements, in preparation for stage 2. Stage 2: In this next stage, your body will begin the process of slowing down its functions in order to help prepare it for deep sleep. Because this stage lasts approximately 20 minutes, it allows both the metabolic and heart rate functions to slow down. Additionally, this stage also helps decrease body temperature and increase brainwave frequency. Stage 3: Once you reach this stage, you will no longer be sensitive to noise or movements. At this point, you will reach a deeper sleep thanks to the slowing down of your brain waves (delta waves) which are interspersed with smaller but faster waves. Stage 4: This last stage before REM sleep is significant as it’s during this period that the body recovers, stimulates growth and development, repairs tissues and muscles, reboots your energy for the next day, and boosts the immune function. Rapid Eye Movement (REM) Sleep: Reaching REM sleep is the most intense stage as it increases the heart rate, blood pressure, and brain activity. It’s also during this period that our brain is able to process and store information in our long-term memory. While in REM sleep, your eyes move rapidly and your breathing becomes shallow, irregular, and fast. Getting sufficient sleep every night is crucial for our overall well-being. 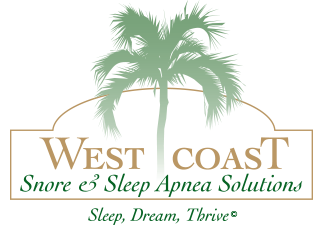 If you struggle to sleep throughout the night and constantly find yourself waking up, it might be time to visit our dentists at West Coast Snore & Sleep Solutions. Seeking a professional diagnosis and treatment can help you regain control of your life. Don’t struggle through another sleepless night. Contact us today to get started. We’ll deliver the right treatment plan for your specific needs.